Create this stunningly simple egg craft using tissue paper! Using the technique of scrunching tissue paper, your child will create a unique egg craft perfect for Easter. 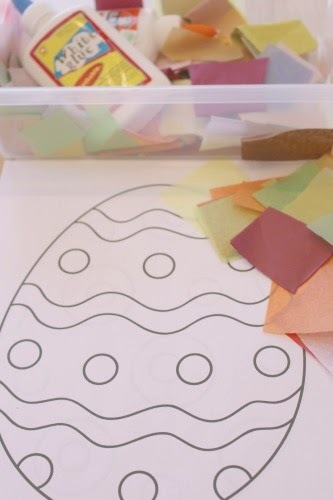 Frame the print to place on the mantle or hang on the refrigerator for all to see-- this egg craft is makes a fun addition to your Easter activities for toddlers or preschoolers. Last year we made some beautiful Easter Egg Art using bleeding tissue paper . The bleeding tissue paper Easter egg collage was a great way to sneak in fine motor skills from manipulating the tissue paper squares and using a squirt bottle to wet the tissue paper. Well, we were crafty again this past week making some new Easter egg art to share with you. This time we used plain tissue paper that is used for gift wrap, and made some beautiful and unique designs using the "scrunching" technique. As a bonus, both of these egg crafts are great for working on fine motor skills. If you have a mix of different ages, either egg craft can be done by toddlers and/or preschoolers. Obviously the end result will vary, but it's all about the process!! 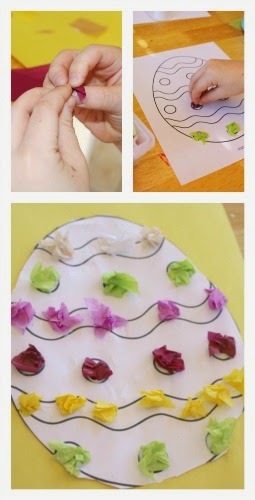 This egg craft is very easy to do! Little ones of all ages can join in and create his/her own unique Easter egg collage. Try this tissue paper art and craft with your kiddos today! To get started, we first printed out Easter Egg coloring templates. Once printed, our fingers got to work scrunching the tissue paper and filling in the outline with different colored tissue paper squares. Love how low-prep this activity turned out to be! Choosing to print out a coloring template gave us designs to follow, however, you could draw a big egg shape on a piece of paper and create your own designs, too. Older kiddos might enjoy drawing various patterns and lines to create their own design. My kiddos loved this fun egg craft using tissue paper! Mom's Easter Egg! Yes, I had to do it, too! We have a BOOK! Click to find out more!